A few new performance upgrades for the Rockstar Edition include FMF pipe and split-clamping-area cnc-machined triple clamps. Vital MX: Last year Husqvarna launched the first ever FC 450 Rockstar Edition bike, which wasn’t a completely surprising move granted KTM has had a Factory Edition for a while now and that the companies seem to make a similar moves. But that also didn’t dampen our enthusiasm for the all-new machine since it was a pretty awesome bike. Style-wise, Husky and KTM are diverging more rapidly than anywhere else and the 2019 FC 450 RE is continuing that tradition. The biggest news that we see on the 2019 Rockstar Edition is a new FMF Racing Factory 4.1 silencer and unbranded a split-design triple clamp. We would be remiss if we didn’t point out how much they look like Xtrig’s ROCS triple clamps but there are obvious differences that make it clear that these are not made by Xtrig and rebranded as Husqvarna. Read on to see all the other changes. 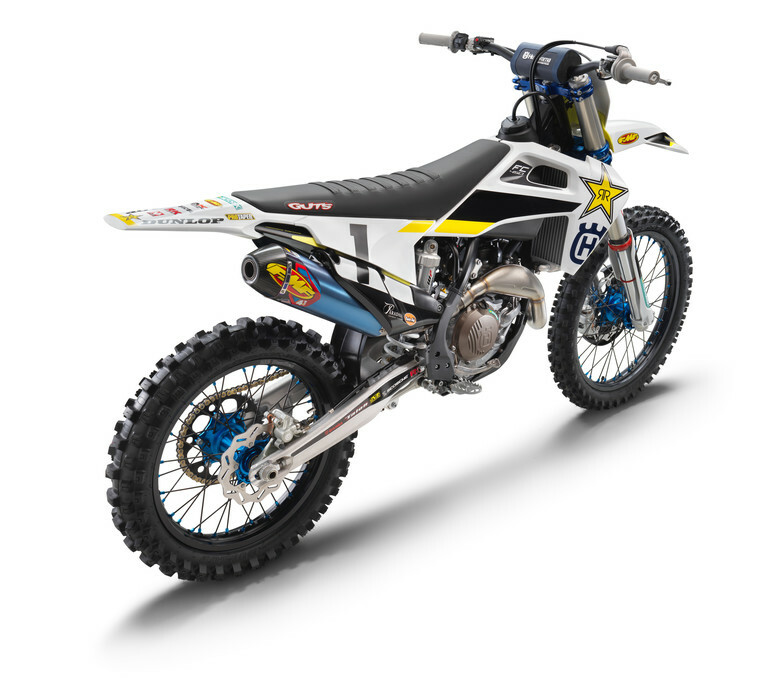 Husqvarna Motorcycles is proud to launch the FC 450 ROCKSTAR EDITION model year 2019, a thrilling production model that forms the basis of the bikes to be used by Rockstar Energy Husqvarna Factory Racing’s AMA Supercross Champions Jason Anderson and Zach Osborne throughout the 2019 season. Collecting feedback from the Rockstar Energy Husqvarna Factory Racing team and their championship-winning riders, Husqvarna Motorcycles engineers have combined this competition data with extensive testing and development to introduce a list of key upgrades. 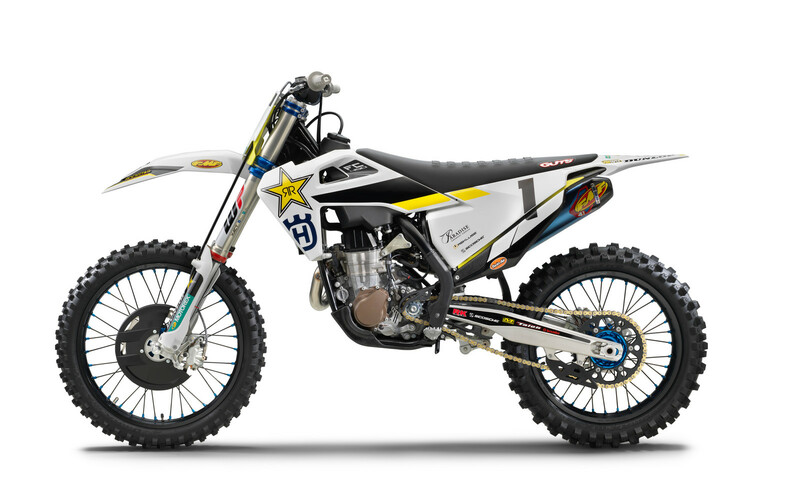 The new FC 450 ROCKSTAR EDITION features the latest in engine and chassis developments, ensuring this state-of-the-art machine offers unrivaled on-track performance. 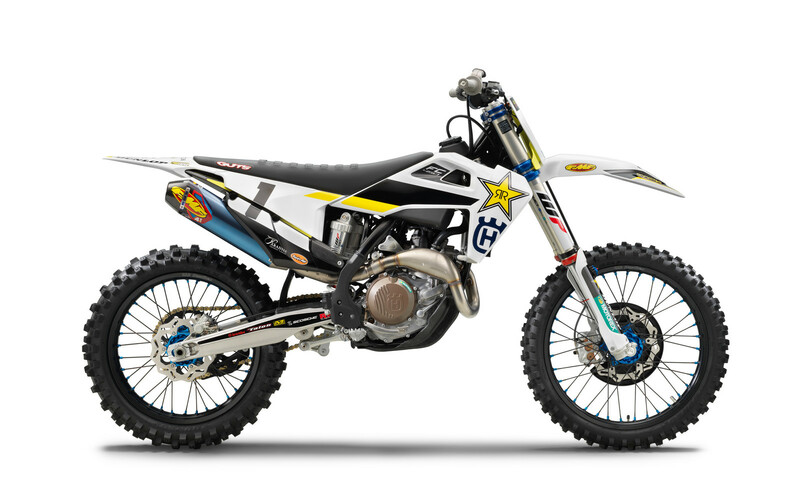 At the leading edge of motocross development, Husqvarna Motorcycles introduce a series of considered upgrades to the FC 450 ROCKSTAR EDITION. 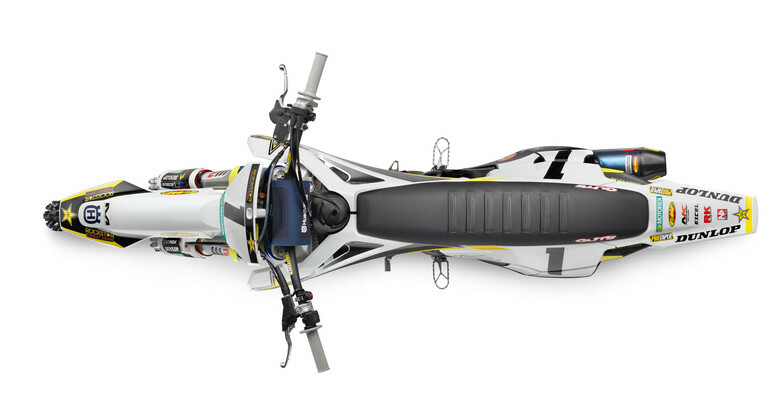 With the distinctive bodywork receiving new graphics, the end result clearly showcases the direction of Husqvarna Motorcycles’ pioneering development. Made from high-grade aluminum, the all-new CNC-machined triple clamps feature optimally tuned steering stem stiffness as well as perfect alignment of the fork tubes for highly responsive and smooth fork action. Maximum gains in handling are provided by easy offset adjustment between 20 or 22 mm. The new Husqvarna FC 450 ROCKSTAR EDITION machine will be available in early 2019 at all authorized Husqvarna Motorcycles Dealers worldwide. For all details on pricing and availability, please refer to Husqvarna Motorcycles North America. I think you are in the wrong hobby/activity/sport if "price" is your #1 requirement. Get a Baja chinese bike then... I didn't think so. I love the blue anodized bits. This bike is a work of art! Agreed. However, they have picked the 100% absolute ugliest #1 for that thing that I have ever seen! Never have I seen a number font that terrible. Other than that, it sure is a sweet looking machine.